You’ve got questions. We’ve got answers. Actually, the vast majority of answers to the most common questions (about everything from Art Grants to Theme Camps to Parking Passes to Volunteering) can be found on the YOUtopia website. If you haven’t read or searched the site yet, we highly recommend you do so – there’s a ton of information there! And if you have a specific-to-you question, you can always email info@sdyoutopia.com and some very nice people will reply to you within a day or so. What is SDCAP and what the heck does it have to do with YOUtopia? SDCAP is the San Diego Collaborative Arts Project. We’re a 501(c)(3) organization, which means we’re a not-for-profit bound to all the corresponding legalities and red tape associated with being this type of organization in California. We’re 100% volunteer run and are the legal entity that encompasses YOUtopia and CoLab, as well as a year-round grant-making organization supporting collaborative art. With respect to YOUtopia specifically, the SDCAP Board of Directors selects YOUtopia’s team of Co-Producers each year, and works collaboratively with those Producers in facilitating the event. The Producers have a ton of discretion in what the event looks like from year to year, and the SDCAP Board provides legal and fiscal oversight, grantmaking stewardship, insurance, etc. It can often be difficult to tease out who makes which decisions. Which is part of why we invite you to join us! Our Board meetings are open to the public and held at CoLab on the 2nd and 4th Weds of every month from 7-9pm. Oh, and hey! We’re recruiting new Board members right meow! Why is there only one ticket tier price this year? In the past several years, T1 and T2 tickets sold out very quickly. In fact, in 2017, Tier 1 sold out in several hours. Because of this, there has been an outcry in the community to do away with the tiered ticketing system. There are arguments both for and against tiers, but the YOUtopia Producers this year decided to give the one price ticket a shot and eliminate the tiers. SDCAP supported the Producers, as we believe we should listen to all segments of the SDBM community. So the YOUtopia Producers and Board of SDCAP decided on one ticket price, just like Burning Man. A participant won’t get penalized because they were working at noon the day tickets launched and couldn’t purchase. But that also means a participant doesn’t get a cheaper price because they could. Part of our thought process was that we would like to welcome new people into our community (just as we all were new once), and what if someone goes to their first burn, loves it and says, “Hey, let me check out that awesome San Diego regional Burning Man event someone told me about while we watched the sunrise in deep playa”? With the one-price structure, people don’t get “penalized” by paying more than someone who’s been going for years, while receiving exactly the same experience as someone who paid less. That’s not how our community should work. In effect, the people who bought the later tiers were subsidizing the lower tiers. They get EXACTLY the same festival experience, but pay more. Newbie or vet, we are all equal in our community. There shouldn’t be an extra charge to join our family. We consider this Radical Inclusion and it’s part of our thought process when we agreed to pilot a one-price system. Why did ticket prices go up? Unfortunately, inflation is real. Bummer, huh?! Among other items, the costs of renting the campground, security, medical and fire safety have all increased. We’ve worked hard to keep YOUtopia’s budget in check to maximize the event while being financially responsible and keeping the event and participants safe. This year, the YOUtopia Producers and the SDCAP Board elected to place pricing in the middle of last year’s tiered pricing structure. In 2017, the three general admission tiers were $120, $155 and $180. The average ticket price for 2017 was $154, which is only $11 less than this year’s price of $165. And, as ticket prices go up most years, a direct comparison to last year’s tier prices isn’t exactly fair. Had we elected to continue using the tiered system, the tiers would have had to gone up as well. Difference: $16.21, which is an 9.4% increase in the average general admission tickets. Why were artists tickets removed? There was a tremendous amount of discussion around this subject and it got rather contentious at times. In the end, the outcome was that the YOUtopia Producers and the SDCAP Board agreed that what is granted is the art, not the artist. In addition, as only 1 artist ticket was available per granted art piece in 2017, we believed the overall impact would not be that large, as the number of artists tickets were very low in 2017 (approximately 120 tickets). Why were build tickets removed? YOUtopia has not had a “build team” ticket in years. As such, we’re not sure where this misconception comes from. That said, this year we increased the number of Low Income Program tickets partly to help counterbalance the removal of the artists tickets. The thought process was that if one cannot afford a regular general admission ticket, we still want you to be a part of the magic. So, we really encourage you to pursue the Low Income Ticket Program. The deadline to apply is midnight, September 14, 2018. How much money does SDCAP make from YOUtopia? Last year YOUtopia had $466,182 in ticket sales and expenses in the amount of $336,621. So, in 2017 YOUtopia netted income of $129,561. For YOUtopia 2018, a 100% sell-out would mean $554,385 in revenue. However, if past history is any indication, it is extremely unlikely YOUtopia 2018 will sell out. YOUtopia 2017 came close, but did not sell out. Nor did YOUtopia sell out in 2016. As such, SDCAP is using projections of a 90% sell out of general admission tickets to base the budget numbers on, which would net $498,947 in revenue. Currently, the revised budget expenses for 2018 are projected to be $392,160, which will provide a net income of $106,787. This is a 17.6% decrease in income from YOUtopia 2017. For reference, please see the YOUtopia 2018 budget here. How does SDCAP use the proceeds from YOUtopia? YOUtopia proceeds fund the year-round use of COLAB, art grants, new and replacement tools at COLAB, producing next year’s YOUtopia, and general overhead (accounting, legal, utilities, training, insurance, office supplies, stamps, blah, blah, blah). The FY 2019 budget will be on the website soon. We are in the process of revising it due to a recent YOUtopia budget update. Also to note, SDCAP is a 501(c)(3) ‘not for profit’ entity, so we are not trying to make a profit and are legally prohibited from being a profit-based entity. We are committed to supporting local community art through year round grants, CoLab and YOUtopia. In addition to supporting CoLab and YOUtopia, we granted over $27,000 for art in fiscal year 2018. 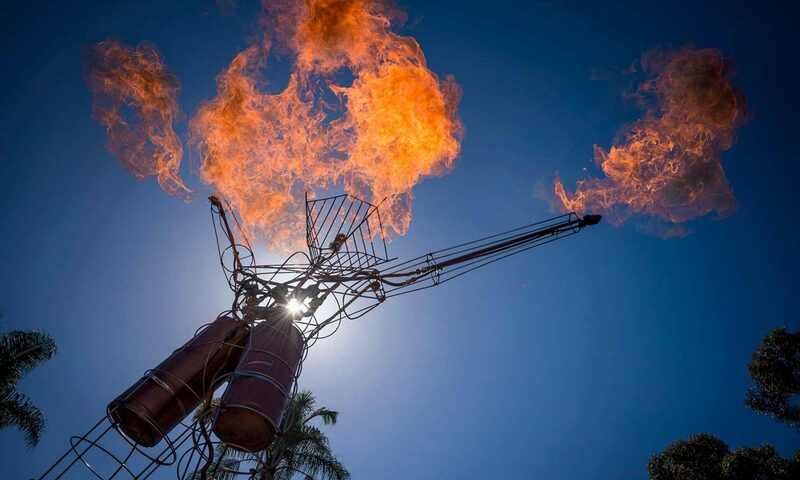 What is the fire suppression unit that was purchased for YOUtopia this year? Under the Principle of Civic Responsibility, the Board and Production Team (as an “event organizer”) is specifically charged with assuming responsibility for public welfare. Ensuring reasonable standards of public safety at YOUtopia may be the single greatest responsibility we have and we take it seriously. We asses major public safety risks and create and implement risk mitigation plans accordingly. Fire is the number one public safety risk at YOUtopia and it represents a real and present danger to the lives of all 3500 participants. YOUtopia is held in a very high wildfire-risk area during the peak of wildfire season. Our dense population, equipment (generators, RVs, heaters, cook stoves etc.) and activities (smoking, fire spinning, fire art, cooking etc.) dramatically increase the already high risk of fire. Additionally, considering the narrow roads and the fact that most of our population is camped at quite some distance from their vehicles, rapid evacuation from the area is a serious challenge. This is not new information and we have worked hard for years to reduce our fire risk through mitigation (e.g. brush clearing and implementation and enforcement of safe use policies for all heat sources and generators) but the bottom line is there is nothing we can do to eliminate this risk and the average response time for the fire department to the campground is 12 minutes. We need to be prepared to immediately contain and control a fire on the mountain. After extensive research we determined that it was materially less expensive for us to acquire the resource and form the team with the skills to use it than it would be to hire one and a team even this year. Moreover, now the unit is available to us year after year and we’ll be able to share it with other local events facing the same risk. Note: per the published YOUtopia Budget, we allocated $20k for this expense but it is currently tracking closer to $15k, and the final expense will be reflected in the actuals once the event is over. If you have additional questions pertaining to CoLab, YOUtopia (or anything else) we want to hear from you! Please come to SDCAP Board meetings which are held on the 2nd and 4th Wednesday of every month at 7pm @ CoLab. Note, however, due to Burning Man, the August 22, 2018 meeting is cancelled so the next meeting will be on September 12, 2018. You are also welcome to email your questions anytime to bod@sdcap.org. We’ll answer as soon as we can, and please be patient. We are all busy working on art, preparing for Burning Man, and pouring our souls into YOUtopia. SDCAP is seeking to fill some vacancies on our Board of Directors for mid-year appointments. Applications are open now and we will be conducting interviews and selecting new Directors on a rolling basis. Read the Position Description and fill out the application if you’d like to apply. Community feedback form coming soon!